User(s) European Union; eurozone: Austria, Belgium, Finland, France, Germany, Greece, Republic of Ireland, Italy, Luxembourg, Netherlands, Portugal, Spain; outside eurozone: Andorra, Monaco, San Marino, Vatican City, Montenegro, Kosovo, French Guiana, Réunion, Saint-Pierre et Miquelon, Guadeloupe, Martinique, Mayotte. Slovenia is scheduled to join the euro zone in January 2007. The euro ( currency sign: €; banking code: EUR) is the official currency of the European Union member states of Austria, Belgium, Finland, France, Germany, Greece, Ireland, Italy, Luxembourg, the Netherlands, Portugal, and Spain - also known as the Eurozone - and is the single currency for more than 300 million people in Europe. Including areas using currencies pegged to the euro, the euro affects more than 480 million people worldwide. The euro was introduced to world financial markets as an accounting currency in 1999 and launched as physical coins and banknotes in 2002. All EU member states are eligible to join if they comply with certain monetary requirements, and eventual use of the euro is mandatory for all new EU members. The euro is managed and administered by the Frankfurt-based European Central Bank (ECB) and the European System of Central Banks (ESCB) (composed of the central banks of its member states). As an independent central bank, the ECB has sole authority to set monetary policy. The ESCB participates in the printing, minting and distribution of notes and coins in all member states, and the operation of the Eurozone payment systems. 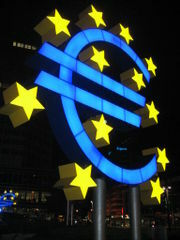 A special euro currency sign (€) was designed after a public survey had narrowed the original ten proposals down to two. The European Commission then chose the final design. The eventual winner was a design allegedly created by a team of four experts who have not been officially named. The official story of the design history of the euro sign is disputed by Arthur Eisenmenger, a former chief graphic designer for the EEC, who claims to have created it as a generic symbol of Europe. 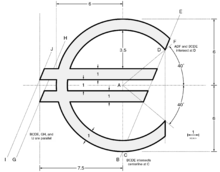 The glyph is (according to the European Commission) "a combination of the Greek epsilon, as a sign of the weight of European civilization; an E for Europe; and the parallel lines crossing through standing for the stability of the euro". The European Commission also specified a euro logo with exact proportions and foreground/background colour tones. Although some font designers simply copied the exact shape of this logo as the euro sign in their fonts, most designed their own variants, often based upon the capital letter C in the respective font so that currency signs have the same width as Arabic numerals. Placement of the currency sign varies from nation to nation. While the official recommendation is to place it before the number (contravening the general ISO recommendation to place unit symbol after the number), people in many countries have kept the placement of their former currencies. The euro was established by the provisions in the 1992 Maastricht Treaty on European Union that was used to establish an economic and monetary union. In order to participate in the new currency, member states had to meet strict criteria such as a budget deficit of less than three per cent of their GDP, a debt ratio of less than sixty per cent of GDP, low inflation, and interest rates close to the EU average. The rates were determined by the Council of the European Union, based on a recommendation from the European Commission based on the market rates on 31 December 1998, so that one ECU ( European Currency Unit) would equal one euro. (The European Currency Unit was an accounting unit used by the EU, based on the currencies of the member states; it was not a currency in its own right.) These rates were set by Council Regulation 2866/98 (EC), of 31 December 1998. They could not be set earlier, because the ECU depended on the closing exchange rate of the non-euro currencies (principally the pound sterling) that day. The procedure used to fix the irrevocable conversion rate between the drachma and the euro was different, since the euro by then was already two years old. While the conversion rates for the initial eleven currencies were determined only hours before the euro was introduced, the conversion rate for the Greek drachma was fixed several months beforehand, in Council Regulation 1478/2000 (EC), of 19 June 2000. The currency was introduced in non-physical form (travellers' cheques, electronic transfers, banking, etc.) at midnight on 1 January 1999, when the national currencies of participating countries (the Eurozone) ceased to exist independently in that their exchange rates were locked at fixed rates against each other, effectively making them mere non-decimal subdivisions of the euro. The euro thus became the successor to the European Currency Unit (ECU). The notes and coins for the old currencies, however, continued to be used as legal tender until new notes and coins were introduced on 1 January 2002. The changeover period during which the former currencies' notes and coins were exchanged for those of the euro lasted about two months, until 28 February 2002. The official date on which the national currencies ceased to be legal tender varied from member state to member state. The earliest date was in Germany; the mark officially ceased to be legal tender on 31 December 2001, though the exchange period lasted two months. The final date was 28 February 2002, by which all national currencies ceased to be legal tender in their respective member states. However, even after the official date, they continued to be accepted by national central banks for several years up to forever in Austria, Germany, Ireland, and Spain. The earliest coins to become non-convertible were the Portuguese escudos, which ceased to have monetary value after 31 December 2002, although banknotes remain exchangeable until 2022. The euro is the sole currency in Austria, Belgium, France, Finland, Germany, Greece, Ireland, Italy, Luxembourg, the Netherlands, Portugal and Spain. These 12 countries together are frequently referred to as the Eurozone or the euro area, or more informally "euroland" or the "eurogroup". The euro is also legal currency in the Eurozone overseas territories of French Guiana, Réunion, Saint-Pierre et Miquelon, Guadeloupe, Martinique and Mayotte. By virtue of some bilateral agreements the European microstates of Monaco, San Marino, and Vatican City mint their own euro coins on behalf of the European Central Bank. Andorra, Montenegro and Kosovo adopted the foreign euro as their legal currency for movement of capital and payments without participation in the ESCB or the right to mint coins. Andorra is in the process of entering a monetary agreement similar to Monaco, San Marino, and Vatican City. Sweden: According to the 1995 accession treaty (approved by referendum), Sweden is required to join the euro and therefore must convert to the euro at some point. Notwithstanding this, on 14 September 2003, a consultative Swedish referendum was held on the euro, the result of which was 55.9% against adopting the common currency versus 42.0% in favour. The Swedish government has argued that such a line of action is possible since one of the requirements for Eurozone membership is a prior two-year membership of the ERM II. By simply choosing to stay outside the exchange rate mechanism, the Swedish government is provided a formal loophole avoiding the theoretical requirement of adopting the euro. Some of Sweden's major parties continue to believe that it would be in the national interest to join, but they have all pledged to abide by the results for the time being and show no interest in raising the issue again. The United Kingdom's eurosceptics believe that the single currency is merely a stepping stone to the formation of a unified European superstate, and that removing United Kingdom's ability to set its own interest rates will have detrimental effects on its economy. Others in the UK, usually joined by eurosceptics, advance several economic arguments against membership: the most cited one concerns the large unfunded pension liabilities of many continental European governments (unlike in the UK) which would, with a greying population, depress the currency in the future against the United Kingdom's interests. The contrary view is that, since intra-European exports make up to 50% of the United Kingdom's total, it eases the Single Market by removing currency risk, although financial derivatives are becoming more accessible to small UK businesses thereby allowing businesses to offset this risk. An interesting parallel can be seen in the 19th century discussions concerning the possibility of the United Kingdom joining the Latin Monetary Union . Many British people also simply like Sterling as a currency as it is part of UK heritage. The UK government has set five economic tests that must be passed before it can recommend that the United Kingdom join the euro; however, given the relatively subjective nature of these tests it seems unlikely that they would be held to be fulfilled whilst public opinion remains so strongly against participation. In November 1999, in preparation for the introduction of the euro notes and coins across the eurozone, the European Central Bank announced as policy a total ban on the issuing of banknotes by entities that were not National Central Banks ('Legal Protection of Banknotes in the European Union Member States'). Unless a derogation could be negotiated by the UK as a condition of entering the eurozone, a change from Sterling to the euro would mean an immediate end to the circulation of Scottish and Northern Irish banknotes (see Sterling banknotes). The ECB have also stated that even with the central bank issued notes, there is 'no room for exclusively national arrangements' - all notes must be produced to the central designs. National variation is allowed in the design of euro coins, and it is possible that the Royal Mint could continue to include the symbols of the home nations on the British designed coinage, although this would have to be included in place of the Queen's portrait. The position of the Crown Dependencies is less clear. The European Union has so far strongly resisted attempts to issue euro-equivalent notes by non-EU states unless steps are taken to enter into a suitable monetary agreement, including the adoption of EU banking and finance regulations (see Andorran euro coins). Denmark negotiated a number of opt-out clauses from the Maastricht treaty after it had been rejected in a first referendum. On 28 September 2000, another referendum was held in Denmark regarding the euro resulting in a 53.2% vote against joining. However, Danish politicians have suggested that debate on abolishing the four opt-out clauses may possibly be re-opened in 2006. In addition, Denmark has pegged its krone to the euro (€1 = DKr7.460,38 ± 2.25%) as the krone remains in the ERM. 1 January 2007 for Slovenia. Date confirmed and finalised by the European Commission, conversion rate 239.640. The final exchange rate was finalised on 2006- 07-11. However, the finalised rate will not be effective until 2007- 01-01. 1 January 2010 for Bulgaria and the Czech Republic. Too high an inflation rate postponed the entry of Lithuania as planned on 1 January 2007. Some of these currencies do not float against euro, and a subset of those even were unilaterally pegged with euro before joining ERM II. See European Exchange Rate Mechanism, currencies related to the euro, and individual currency articles for more details. Cyprus, Estonia, Latvia, Lithuania, Malta, Slovakia and Slovenia have already finalised the design for the country's coins' obverse side. Bulgaria and Romania are not yet members of the EU, but are scheduled to enter on January 1, 2007. Although the failure of the European Constitution to be ratified would have no direct impact on the status of the euro, some debate regarding the euro arose after the negative outcome of the French and Dutch referenda in mid 2005. A poll by Stern magazine released 1 June 2005 found that 56% of Germans would favour a return to the mark. Members of the Northern League northern Italian separatist political party have discussed calling a referendum to return Italy to the lira. Members of the far-right nationalist Movement for France political party have proposed holding a referendum to return France to the franc. In contrast to Germany, a poll in Austria on 7 June 2005 showed the overwhelming support of the euro as 73% of the sample said they preferred to keep the common currency with only 21% in favour of returning to the old currency, the Schilling. Soon after these suggestions were made, the European Commission issued a statement denying any possibility of this, stating "the euro is here to stay". More recently, in April 2006, after the Italian elections, the subject once again came up. Again, the EU strongly refuted this, calling the suggestion "impossible". In economic theory the degree of fullfillment of the following four criteria indicate whether an area is optimal for a monetary union. These criteria are often called the optimum currency area (OCA) criteria. Although these criteria are not exhaustive and far from absolute, they are generally accepted as a reasonable metric to establish an OCA. There are three economic criteria (labour and capital mobility, product diversification, and openness) and one political criterion (fiscal transfers). Since establishing a single currency over a region necessitates surrendering the ability to tailor monetary policy to specific local conditions, these four characteristics measure the ability of the economy to smooth local economic movements in the absence of monetary policy. Robert A. Mundell formulated the idea that perfect capital and labour mobility would mitigate the adverse consequences of asymmetric shocks in a currency area. While capital is quite mobile in the Eurozone, labour mobility is relatively low, especially when compared to the U.S. and Japan. Peter Kenen formulated the idea that widely diversified production and export structures that are similar between the areas that form the currency area lower the effect and probability of asymmetric shocks. The Eurozone scores quite well on this criterion, and monetary integration seems to further improve the diversification of production structures. Ronald McKinnon formulated the idea that areas which are very open to trade and trade heavily with each other form an optimum currency area. This is because the high trade intensity will lower the significance of the distinction between domestic and foreign goods as competition will equalize the prices of most goods, independently of exchange rates. The Eurozone members trade heavily with each other (intra-European trade is greater than international trade), and all evidence so far seems to indicate that the monetary union has at least doubled trade between members. The term " fiscal transfers" refers to the transfer of money between areas. Regions that are economically worse off or suffer from negative economic shocks receive money, creating a counter cyclical effect that lowers the price, wage, and unemployment differentials between regions. Theoretically, Europe has no-bail out clause in the Stability and Growth Pact, meaning that fiscal transfers are not allowed, but it's impossible to know what will happen in practice. So as the Eurozone has a single monetary policy and a single interest rate set by the ECB, it cannot be fine-tuned for the economic situation in each individual country. While Europe scores well on some of the measures characterizing an OCA, it has lower labour mobility than the United States and similarly cannot rely on Fiscal federalism to smooth out regional economic disturbances. The most obvious benefit of adopting a single currency is removing from trade the cost of exchanging currency, theoretically allowing businesses and individuals to consummate previously unprofitable trades. On the consumer side, banks in the Eurozone must charge the same for intra-member cross-border transactions as purely domestic transactions for electronic payments (e.g. credit cards, debit cards and cash machine withdrawals). The absence of distinct currencies also removes exchange rate risks. The risk of unanticipated exchange rate movement has always added an additional risk or uncertainty for companies or individuals looking to invest or trade outside their own currency zones. Companies that hedge against this risk will no longer need to shoulder this additional cost. The reduction in risk is particularly important for countries whose currencies have traditionally fluctuated a great deal, particularly the Mediterranean nations. Another effect of the common European currency is that differences in prices — in particular in price levels — should decrease because of the Law of one price. Differences in prices can trigger arbitrage, i.e. speculative trade in a commodity between countries purely to exploit the price differential, which will tend to equalise prices across the euro area. Similarly, price transparency across borders should help consumers find lower cost goods or services. In reality, the effects of the euro over the level of the prices in Europe is disputable. Many citizens cite the strong increase in prices in the years after the introduction of the euro, although numerous empirical studies have failed to find much real evidence of this. It is speculated that the reason for this perception is that the prices of small, everyday items were rounded up significantly. For example, a cup of coffee that once cost two German mark might now cost €1.50 or even €2.00 - a 50-100% increase. At the same time, a large appliance or rent payment rounded up to the next obvious euro level would be a negligible proportional increase. The fact that the prices people see every day were affected more strongly might explain why so many people perceive the "euro effect" as being significant, while official studies — which look at the breadth of expenditures, in proportion — would downplay it. Low levels of inflation are the hallmark of stable and modern economies. Because a high level of inflation acts as a highly regressive tax ( Seigniorage) and theoretically discourages investment, it is generally viewed as undesirable. In spite of the downside, many countries have been unable or unwilling to deal with serious inflationary pressures. Some countries have successfully contained by establishing largely independent central banks. One such bank was the Bundesbank in Germany; as the European Central Bank is modeled on the Bundesbank, it is independent of the pressures of national governments and has a mandate to keep inflationary pressures low. Member countries join the bank to credibly commit to lower inflation, hoping to enjoy the macroeconomic stability associated with low levels of expected inflation. The ECB (unlike the Federal Reserve in the United States of America) does not have a second objective to sustain growth and employment. National and corporate bonds denominated in euro are significantly more liquid and have lower interest rates than was historically the case when denominated in legacy currency. While increased liquidity may lower the nominal interest rate on the bond, denominating the bond in a currency with low levels of inflation arguably plays a much larger role. A credible commitment to low levels of inflation and a stable reduces the risk that the value of the debt will be eroded by higher levels of inflation or default in the future, allowing debt to be issued at a lower nominal interest rate. The euro is widely perceived to be one of two, or perhaps three, major global reserve currencies, making inroads on the widely used U.S. dollar (USD), which has historically been used by commercial and central banks world-wide as a stable reserve on which to ensure their liquidity and facilitate international transactions. A currency is attractive for foreign transactions when it demonstrates a proven track record of stability, a well-developed financial market to dispose of the currency in, and proven acceptability to others. While the euro has made substantial progress toward achieving these features, there are a few challenges that undermine the ascension of the euro as a major reserve currency. Persistent excessive budget deficits of member nations, economically weak new members, and serious questions regarding expansion threaten the place of the new currency. As a new reserve currency, government sponsoring the euro do receive some substantial benefits. Since money is effectively an interest free loan to the government by the holder of the currency — foreign reserves act as subsidy to the country minting the currency (see Seigniorage). Some European nationalist parties oppose the euro as part of a more general opposition to the principle of a European union. A significant group of these include the members of the Independence and Democracy bloc in the European Parliament. Additionally the Green Party of England and Wales is opposed for anti-globalisation reasons but their stance is not shared by rest of the European Green Party bloc in the European Parliament. In their view, the countries that participate in the EMU have surrendered their sovereign abilities to conduct monetary policy. The European Central Bank is required to pursue a policy that might be at odds with national interests and there is no guarantee of extra-national assistance from their more fortunate neighbors should local conditions necessitate some sort of economic stimulus package. Many critics of the EMU believe the benefits to joining the organization are outweighed by the loss of sovereignty over local policy that accompanies membership. The ECB targets interest rates rather than exchange rates and in general does not intervene on the foreign exchange rate markets, because of the implications of the Mundell-Fleming Model, being the fact that a central bank can not maintain an interest rate target and an exchange rate target simultaneously, as increasing the money supply would result in a depreciation of the currency. In the years following the Single European Act, the EU has liberalized its capital markets, and as the ECB has chosen for monetary autonomy, the exchange rate regime of the euro is flexible, or floating. This explains why the exchange rate of the euro vis-à-vis other currencies is characterized by strong fluctuations. Most notable are the fluctuations of the euro vs. the U.S. dollar, another freely floating currency. However this focus on the dollar-euro parity is partly subjective. It is taken as a reference because the European authorities expect the euro to compete with the dollar. The effect of this selective reference is misleading, as it give to the observers the impression that a rise in the value of the euro vs the dollar is the effect of an increased global strength of the euro, while it may be the effect of an intrinsic weakening of the dollar itself. After the introduction of the euro, its exchange rate against other currencies, especially the U.S. dollar, declined heavily. At its introduction in 1999, the euro was traded at US$1.18; on 26 October 2000, it fell to an all time low of $0.8228 per euro. It then began what at the time was thought to be a recovery; by the beginning of 2001 it had risen to nearly $0.96. It declined again, although less than previously, reaching a low of $0.8344 on 6 July 2001 before commencing a steady appreciation. The two currencies reached parity on 15 July 2002, and by the end of 2002 the euro had reached $1.04 as it climbed further. On 23 May 2003, the euro surpassed its initial ($1.18=€1.00) trading value for the first time. At the end of 2004, it had reached a peak of $1.3668 per euro (€0.7316 per $) as the U.S. dollar fell against all major currencies, fuelled by the so called twin deficit of the US accounts. Although the US trade imbalances are heavily against East Asia rather than Europe, East Asia's reluctance to let their currencies rise has led to the euro's rising in its place. However, the dollar recovered in 2005, rising to $1.18 per euro (€0.85 per dollar) in July 2005 (and stable throughout the second half of 2005). The fast increase in U.S. interest rates during 2005 had much to do with this trend. By mid-2006, the euro had risen to $1.28. 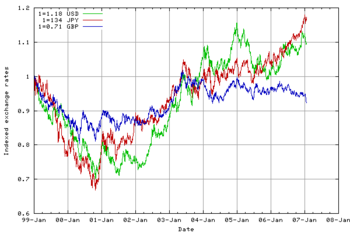 On 2006- 11-24, the euro hit a 19-month high against the US dollar, reaching $1.3109 to the euro. There are a number of foreign currencies that were pegged to a European currency and are now currencies related to the euro: the Cape Verdean escudo, the Bosnia and Herzegovina convertible mark, the Bulgarian lev, the CFP franc, the CFA franc and the Comorian franc. In total, the euro is the official currency in 16 states inside the European Union, 2 state/territory outside the European Union. In addition, 25 states and territories have currencies that are directly pegged to the euro including 14 countries in mainland Africa, 4 EU members that will ultimately join the euro, 3 French Pacific territories, 2 African island countries and 2 Balkan countries. 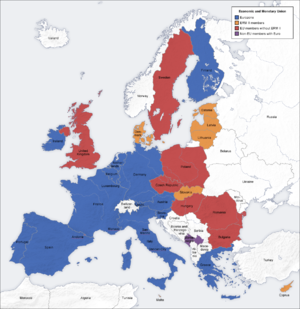 Several linguistic issues have arisen in relation to the spelling of the words euro and cent in the many languages of the member states of the European Union, as well as in relation to grammar and the formation of plurals. However, in each country but Greece, which uses λεπτό and λεπτά on its coins, the form "cent" is officially required to be used in legislation in both the singular and in the plural. Immutable word formations have been encouraged by the European Commission in usage with official EU legislation (originally in order to ensure uniform presentation on the banknotes), but the "unofficial" practice concerning the mutability (or not) of the words differs between the member states and their languages. The subject has led to much debate and controversy.